An agricultural robot specifically designed to perform pest control activities. At the start of the movie Runaway, Jack Ramsay and his new partner are called in to work with an agricultural robot that is out of control and zigzagging around in a corn field. He gets the lowdown from his staff. 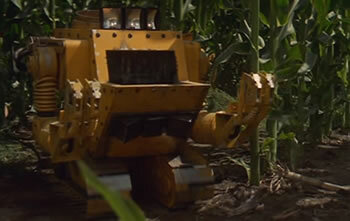 This movie agro-bot (or just agbot) has a very nicely programmed sense of touch; it can pick a larva off a leaf easily. 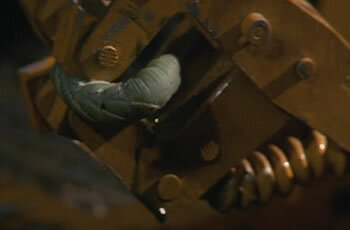 It turns out that Crichton or his special effects guys must have been paying attention to the robotics news. The first intelligent agricultural robot (as opposed to farm machinery) was tested in use for tomato harvesting in Tampa, Florida in 1983. Read these related stories; AgBots: Agricultural Robots Take The Field and Robotic Tomato Harvester Ready For Space. Take a look at an interesting journal article on Agro-Robotics here; it includes a set of links to some interesting papers. - Promobot, The Runaway Russian Robot!